Cherrywood is an active adult community located in Ocala, Florida, about five miles south of Highway 22. Cherrywood enjoys easy access to Interstate 75 and is only minutes away from restaurants, shopping, and hospitals. This makes for the perfect combination of country living with nearby city conveniences. Cherrywood is a smaller community, but with larger lots than most nearby 55+ communities. Since beautiful weather is the norm in this region, residents get to make the most of all the outdoor amenities offered in this 55 and over community. Residents with animals need not worry, as pets are welcome at Cherrywood. There are plenty of areas to exercise them and the association allows fences to be built to keep pets happy and safe while enjoying the Florida sunshine with their beloved owners. The Cherrywood clubhouse features a fitness center which hosts a variety of exercise classes, such as stretch 'n tone, Pilates, and aerobics. There are also a variety of hobby rooms for cards, sewing, and arts and crafts. Billiards and a library serve for some welcome rest and relaxation. A ballroom with stage plays host to a variety of year-round social events. Outdoors, a swimming pool with a spa as well as a picnic area set the stage for relaxation and social events. For activities, there are tennis courts, shuffleboard courts, bocce ball courts, a basketball court and horseshoe pits. Construction at Cherrywood started in 1996 by Cherry Developers and was completed in 2003. A total of 700 single-family homes make up this 55 and over community. Residences are available on a resale basis and range in sizes from 800 to 2,281 square feet. All homes in Cherrywood are concrete block and stucco and sit on nicely sized lots - most of them are about quarter-acre in size. The low homeowners' association fee includes common area maintenance, basic cable, and curb side trash pick up. For a smaller community, Cherrywood in Ocala has many clubs and events. Some of the clubs are accordion, tennis, bowling league, needlecraft, poker, mah jongg, crocheting, chess, songbirds, quilting, and Veterans club. It has its own newsletter, which is very in-depth and comes complete with a monthly calendar of scheduled events. Some of the events that take place at Cherrywood are blood drives, casino trips, AARP driver safety program, bingo, holiday dances, and singles dinners. Birthdays, anniversaries, and other announcements are included in the Cherrywood newsletter. 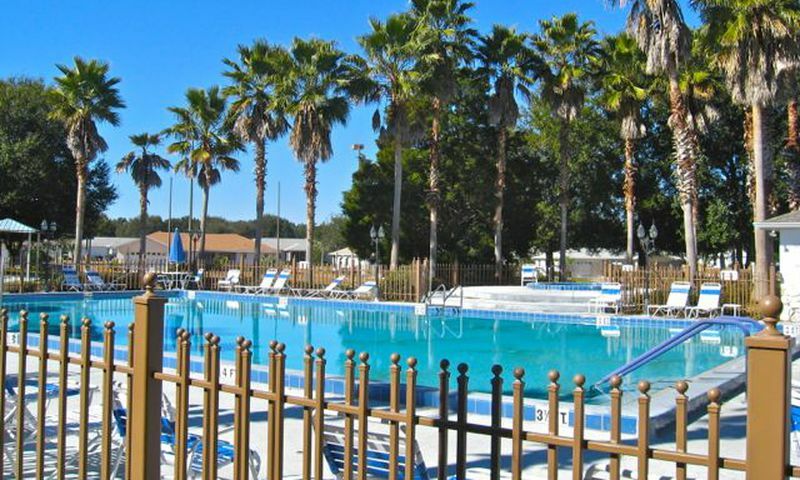 Ocala, Florida is a very family-friendly city only minutes away from Cherrywood and offers countless options of different restaurants and ongoing events. For family entertainment, Ocala features year round theater performances, concerts, public festivals, dance recitals, and special museum exhibits. Picnics and hikes in Ocala's parks, or carriage tours, are a very inexpensive way to enjoy life. The Ocala National Forest, the Marion Theater, the Appleton Museum of Art, the Don Garlits Museum of Drag Racing, and the Howard Academy Community Center are also worth checking out. For a change of scenery, both Florida coastlines are about an hour's drive away from Ocala. When the grandchildren come to visit, Orlando beckons with Disney World, Universal, Sea World, and Busch Gardens, which are only an hour away as well. Well-built homes in a great low-maintenance community brings active adults from across the country to Cherrywood in Marion County, Florida. There are plenty of activities available in Cherrywood. Here is a sample of some of the clubs, activities and classes offered here. Single-family homes offered in Cherrywood are available on a resale-only basis. These homes range from 800 to 2,281 two to four bedrooms, one to three bathrooms, and an attached one to three-car garages. These low-maintenance homes are perfect for active adults. I've moved in a year ago, and am very happy here there is quite a bit to do and everyone is happy to let you join in. The only time I've been unhappy when the pool pump went out and it took longer to fix then it should have. All in all I think the fees are reasonable compared to other 55 communities. I'd rebuy here in a heart beat! My mother lives in Cherrywood and is very happy. She has more friends than I do! The club house and pool are nice. My kids love coming to visit and swim. The yards are all well kept and the neighbors seem to really look out for one another. I am a resident for 17 years. The services provided are not worth the fees. Association which had legal and financial powers changed its name to Harwood Properties. to buy and you will have far less problems. Yes I'm a resident. However there is much discrimination against renters here. Yes the amenities are nice but renters do not have the use of the fitness rooms, are not included in their directory and a few other privileges. People are not every friendly. If you are looking for quiet this is the place to be. I have been at Cherrywood for a few years and like how quiet and casual this place is. My house was priced good so I don't have to worry about living beyond my means here. I play bocce and pickleball, poker and dominos. Living here keeps me busy and I enjoy spending my time with the people here. I feel you should have photos of all the areas you offer such as the fitness center inside and out, and all the other activity areas. I only saw 3 phots on your web site. 55places.com is not affiliated with the developer(s) or homeowners association of Cherrywood. The information you submit is distributed to a 55places.com Partner Agent, who is a licensed real estate agent. The information regarding Cherrywood has not been verified or approved by the developer or homeowners association. Please verify all information prior to purchasing. 55places.com is not responsible for any errors regarding the information displayed on this website.